I’ve mentioned floods several times in these posts, but haven’t gone into specifics about any them, so let me quickly explain before I talk about the big one. We have a drain on our roof that sends rain water from up there, down through a large pipe that is inside the apartment on one wall. That water goes into our main drain along with all the sink or shower or toilet water. There are also two holes in the floor, one is an old pipe opening and one is a drain in the bedroom area. 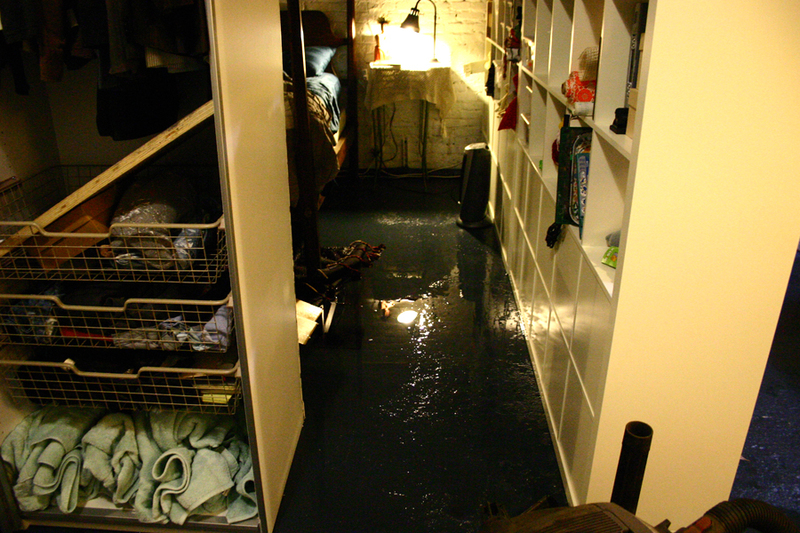 Most of the floods in the beginning involved one of the toilets overflowing in the back of the apartment, and draining all the way into that area in the bedroom because there is a slight slant to the floor. This was a lot of water because it went really far, but at least it went somewhere (into that drain). We had Roto-Rooter come a few separate times to snake the drain in the floor and everything seemed fine for a few days or weeks. The hole in the floor and the source of the water. Then one fateful day, there was a huge snow storm and the roof was covered. We woke up the next morning and Jeff put his hand to the floor to get his phone to check the time and it was floating in water. My brain started to function in that sluggish morning way, and I began to realize that our bed was surrounded by 3 inches of water. 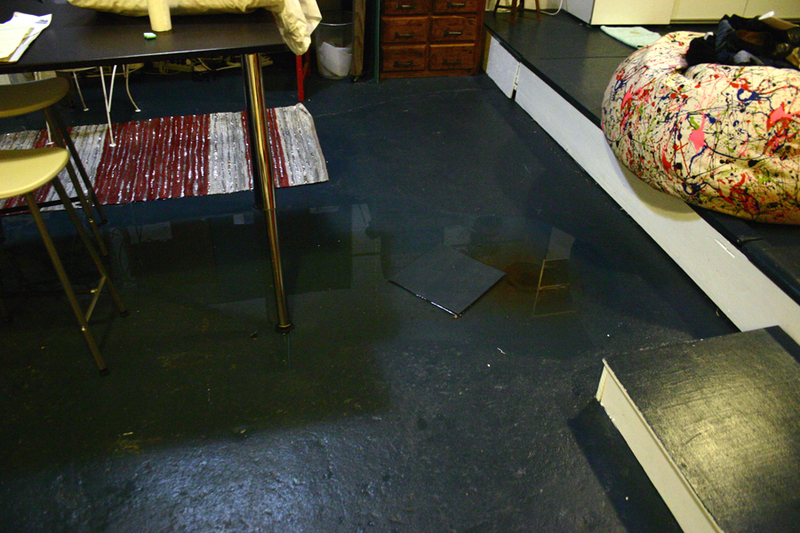 The water was coming from the pipe hole in the floor and it was no longer draining into that drain in our bedroom. It wasn’t going anywhere. 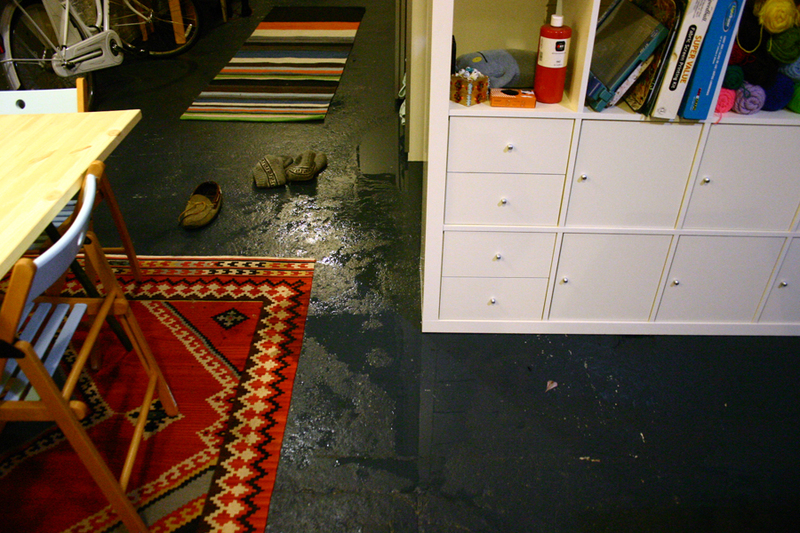 As the snow melted on the roof, more water flowed into the apartment because of a blockage in the pipe. 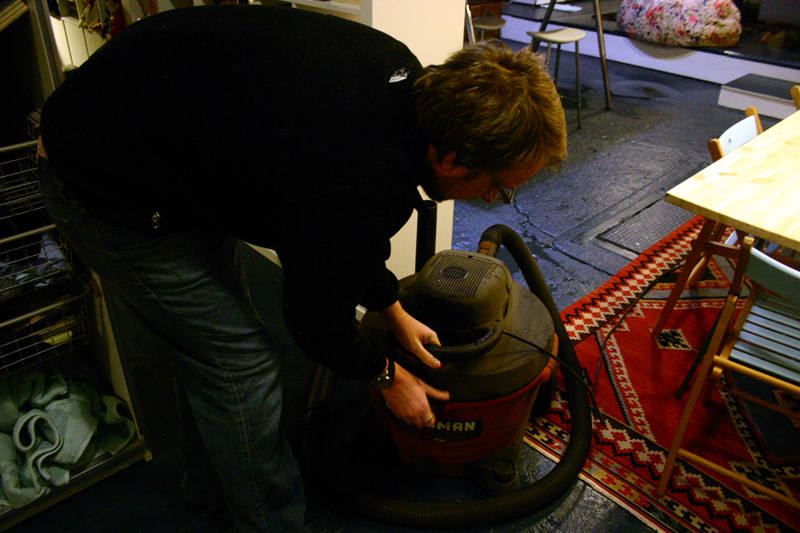 Jeff spent the whole day away from work, waiting for the plumber to come, sucking water out in a shop vac as it steadily came up from the pipe. They finally came, they fixed it, and everything has been dandy until today. Jeff filled this up at least 20 times! We were tracking water everywhere throughout the apartment! Now, we know the signs of a major flood on its way, and when we think something might happen, we check to see if water is in the pipe in the floor. If it is, then things aren’t draining properly. I noticed there was some in there, so we called Roto-Rooter again and the guy that came basically told me we no longer have our 6 month guarantee because something much worse must be wrong. He has suggested that we have them send a camera through the drain to see if it is cracked, broken or separated and allowing dirt to pile up in the pipe. If it is, my landlord would have to tear up the cement floor about 3 feet down to fix it and then pour concrete again over it. In other words, we would have to move. No decision has been made, but I will say that a huge rain storm is coming at the end of the week and I’m not feeling great about all of this right now. How are you holding up in all this rain? Hope you won’t have to move after putting so much love and work into making your apartments such a gorgeous space. You guys did an amazing job!